Step 2: After admin verification an author will receive confirmation email from IJAMMC. Step 1: After login click on submit an article link on the left navigation. Step 2: Fill all required fields and click on submit. Now, your article is submitted to IJAMMC administrator. Under Review: All articles assigned to the reviewers shall move under review section. Such articles can access by clicking on under review tab on the left navigation. Under Modification: If any changes / reviews have been suggested by reviewers those articles will move to under modification section. Rejected Articles: All rejected articles by reviewers can show in this section. Approved Article: All approved articles by reviewers can show in this section. Authors are allowed to edit / resubmit their articles whenever they are under review or modification section. Step 1: Click on under review or modification tabs on left navigation. Step 2: Find your article to resubmit. Step 3: Click on resubmit. Step 4: Fill are required fields and submit the article. Authors may view suggestions made by reviewers under modification section (However, author will get email alert for all reviews). Step 1: Click on under modification section. Step 3: Click on reviews button. Step 4: You can view all reviews done by reviewers and reply them from this section. 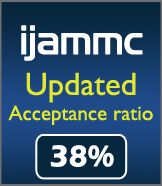 Step 2: After admin verification a reviewer will receive confirmation email from IJAMMC. An IJAMMC administrator can assign a reviewers to the articles whichever submitted by authors. After successful of assigning a reviewer such articles will be available to assigned reviewers. Step 1: Go to Article under modification section to access all assigned articles by admin. Step 3: Now, you are in article overview page. From here reviewer may download / approve / Reject / suggest any review to authors. Step 4: All approved articles will move to approved articles section. Step 5: All rejected articles will move to rejected articles section. Step 1: Go to Article under modification section and open the articles you would like to update. Step 2: Reviewers can post suggestions / Read replays from authors under this section.